Leroy Chiao, AstroCritic, is a former NASA astronaut and commander of the International Space Station. During his 15-year flying career, he performed six spacewalks and spent nearly 230 days in space. Chiao is the special adviser for human spaceflight to the Space Foundation and the Houston Association for Space and Science Education. He also holds appointments at Baylor College of Medicine and Rice University. Chiao contributed this article to Space.com's Expert Voices: Op-Ed & Insights. Some time ago, I participated in a remote panel discussion via streaming video that included Andy Weir, author of "The Martian" (Crown, 2014). The topic of course, was Mars and what it might be like to be an astronaut there. I must admit that I was unaware of Weir's book at the time. But I came to hear that it was a well-written, good story and that he didn't take too many technical liberties. So, it was with some anticipation that I watched the Houston preview of "The Martian," the movie version of the book, out in theaters next month. 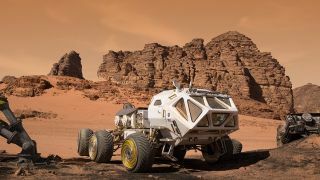 The film begins on the surface of Mars , where an international crew of astronauts is partway through its mission. A large storm approaches, and the crew retreats to its Mars Ascent Vehicle (MAV) to ride out the bad weather, and abort to orbit if conditions get beyond limits. After the storm hits, mission commander Melissa Lewis (Jessica Chastain) leads an extra-vehicular activity (EVA) sortie back outside (for somewhat unclear reasons). During the EVA, a piece of flying debris strikes astronaut Mark Watney (Matt Damon ) and he disappears from view. Telemetry from his suit, being monitored inside the spacecraft, indicates that his suit pressure integrity has been breached. However, no biomedical data are received, leaving doubt as to his condition. Lewis orders the rest of the EVA crew back to the vehicle, while she searches for Watney. The storm worsens, and the crew must abort before the winds topple the MAV. Lewis reluctantly returns and gives the order to abort, leaving Watney, presumed dead, behind. After the storm passes, the audience sees Watney lying face down. His suit is beeping, with a voice alarm warning him of low remaining oxygen. His suit is leaking, but not too badly. He wakes up, realizes his situation and stumbles into the habitation module of the Mars base. After collecting himself and taking stock of the situation, he comes to understand that while he is safe for the moment, he has only enough food for a little more than 30 days. The life-support systems are working, but he has no communication with the crew or mission control back on Earth. It would appear that he has survived his injuries and near suffocation, only to face starvation. The movie portrays the operational side of things pretty well. Astronauts and NASA think through every scenario as thoroughly as possible, and plan for every reasonable contingency. Still, we sometimes get surprised. In those cases, it is up to individual and collective creativity to solve the problem and try for a good outcome. The movie holds up on this account. At this point in the film, Watney must figure out how to let NASA know that he is alive, and how to extend his resources, so he can survive until a rescue mission can be mounted. This seems true to life. Astronauts have a deep sense of mission, and a strong will to survive. It is in our nature to want to achieve or exceed mission objectives. This is how we are evaluated, but more importantly, this is how we evaluate ourselves. During the assembly phase of the International Space Station (ISS), each assembly mission had to succeed in order for the following mission to work. When I was the EVA leader of the second major ISS-assembly Space Shuttle mission, it became almost my obsession to make sure we had thought through and practiced for every little thing that could go wrong during our EVAs. During survival training, new astronaut candidates are drilled in never giving up. A big part of ISS training involves drills in isolating leaks and toxic-chemical release, as well as fighting and retreating from fire. You have to believe that you are going to survive, and practice how you are going to do it. Not just the mission, but also several aspects of the physical reality of the movie are convincing. From a technical perspective, the hardware depicted in the film looks pretty good. Of course, the spacesuits look much cooler than the real ones I used. And having been an EVA specialist myself, I drooled over the film's expansive airlock that astronauts walk into, with ample room to spare! The movie glosses over certain things, like the "oxygenator," which presumably converts something into oxygen (maybe water). Surprisingly, there really weren't any "cool" sci-fi gadgets, which actually made the film ring true. A few minor errors caused me some irritation, like depicting zero-G EVA without the use of safety tethers, and the pronunciation of the name of the mother ship, "Hermes." Everyone in the movie calls it "her-meez." Geez, wasn't there anyone involved in the making of this film willing to correct them (should be pronounced "air-mez")? The movie takes a few major technical/operational liberties, but only two really bothered me. In my view, they were unnecessary. Yes, they increased the drama of the moment, but they were not believable and I think the film would have been just as exciting without them. I won't describe these liberties in detail here — so as not to give the film away — but, you will know them when you see them: During the attempt to rescue Watney, more thrust is needed (shades of Star Trek's "More power, Scotty! "); the two solutions attempted were not credible. Also, the depictions of NASA and international relations, especially with China, are somewhat simplified. But the message is one that resonates. When NASA started working with the Russians in the early 1990s, I was a skeptic (I grew up during the Cold War). I quickly came to see the bigger picture, that working together was a positive. In the immediate aftermath of the collapse of the Soviet Union, when resources in Russia were scarce, it was the Space Shuttle saved the Russian Mir station program. After the Space Shuttle Columbia accident, the Russians stepped up and kept Americans aboard ISS. The fact is, international cooperation in civil space programs has improved relations between partner nations. Although relations today between the United States and Russia could be better, I argue that they would be worse if we didn't have this highly visible ISS program together. We can and should go down the same path with other countries, like China. One scene struck home for me emotionally. At that point in the film, things are not looking good for Watney, and he records a message for his parents (he has no other family), which he hopes will be found if he doesn't make it. In preparing for spaceflight, most astronauts think through the contingency of dying. Before each of my missions, I updated my will, put all of my affairs in order and assembled a package, to be opened only if I was killed. Included in the package were very personal letters to each of my loved ones. Fortunately for me, my packages were never needed. I burned each one by myself, after my mission. As one might expect, the film takes the viewer through ups and downs, highs and lows, hope and despair. But, it works. It is a good story and worth a viewing.